As a House committee prepares to vote on a bill requiring the EPA to set a safety standard to protect children from the rocket fuel contaminant perchlorate in tap water, a new analysis by Environmental Working Group finds that 250,000 one-year-olds are exposed to perchlorate above the government’s safe dose, from food sources alone. This is the equivalent of 1 in every 16 one-year-olds in the country. In the 28 states where perchlorate contaminates tap water, children face even higher exposures and potential health harm. The Congress is considering action in large part because the Bush EPA, bending to defense industry pressure, decided in April, 2007, to indefinitely delay development of tap water standards for perchlorate, leaving hundreds of thousands of children unprotected. Source: EWG analysis of May 2007 FDA food tests (FDA 2007) combined with children's food consumption patterns detailed in CDC's National Health and Nutrition Examination (NHANES 1999-2004). Estimated exposures are compared against EPA's "safe" dose, the Reference Dose or RfD, of 0.7 micrograms of perchlorate per kilogram of body weight per day. 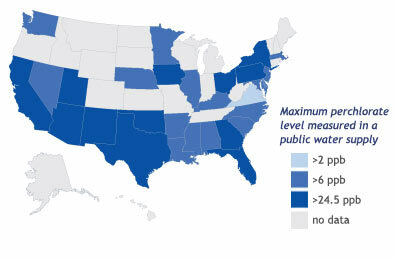 States with one or more community tap water supplies polluted above the levels shown above are taken from a 2005 GAO report (GAO 2005). Perchlorate, the explosive ingredient in solid rocket fuel, can alter thyroid hormone levels critical to a child's healthy development. A landmark 2006 study from the Centers for Disease Control (CDC) found significant effects at perchlorate levels five times lower than EPA's current "safe" dose (Blount et al. 2006b). Perchlorate can occur naturally in the environment, but a portion of this contamination in milk, produce, and fruit juice comes from farm irrigation water polluted by massive rocket fuel contamination of the Colorado River from a defense industry contractor site near Las Vegas. Rocket fuel contaminates not only common foods eaten by toddlers, but also tap water across the country. Government-mandated tests revealed rocket fuel contamination of tap water in 28 states nationwide as of January, 2005 (GAO 2005). Despite widespread pollution, the Environmental Protection Agency (EPA) has repeatedly declined to set a safety standard for rocket fuel in tap water, yielding to pressure from the defense industry. FDA food tests published last spring have allowed EWG to conduct a first-ever analysis of children's exposures to perchlorate from both food and tap water (FDA 2007). Our findings highlight the urgent need for the EPA to establish a health-protective perchlorate standard for all communities with contaminated tap water. In the absence of federal standards, California and Massachusetts have set state-level tap-water safety standards. EPA has established a non-enforceable "safe" dose known as the reference dose, or RfD, and has translated this dose into an equivalent but non-enforceable “safe” drinking water level known as a DWEL (drinking water equivalent level) (EPA 2005). With significant numbers of young children exceeding EPA’s safe dose from contaminated food alone, even more children would be overexposed if they drank tap water polluted with perchlorate at levels comparable to any of these state or federal “safe” levels. A 2006 epidemiological study by the Centers for Disease Control and Prevention (CDC) raised significant questions about the adequacy of these "safe" doses. CDC found that perchlorate exposures well below the EPA "safe" dose (the RfD) significantly reduced thyroid hormone levels in many women (Blount et al 2006b). This study raises concerns for developing children in utero whose growth depends on their mother's thyroid hormones. The dose of perchlorate needed to impair a toddler's growth remains unknown, but there is no reason to expect that young children's thyroid glands are less sensitive to perchlorate than grown women's. For contaminated food alone (no tap water exposures): 1 in 16 one-year-old children are exposed to perchlorate at levels exceeding EPA's "safe" dose (RfD - 0.7 micrograms of perchlorate per kilogram of body weight per day). 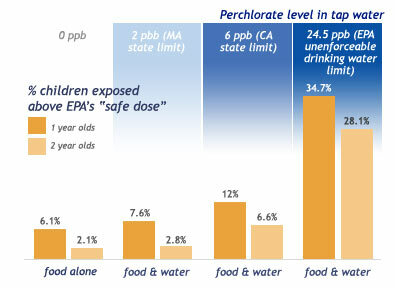 For food and tap water exposures combined: If children consumed tap water contaminated with just 2 parts per billion (ppb) of perchlorate (Massachusetts' state drinking water standard) in addition to perchlorate-contaminated food, 1 in 13 one-year-old children would be exposed above EPA's "safe" dose for perchlorate. Numbers may be even higher in communities within the 28 states where government tap water tests have found perchlorate at levels exceeding 2 ppb (see Figure 1). For food and tap water exposures combined: If children consumed tap water contaminated with just 6 parts per billion (pbb) of perchlorate (California's state drinking water standard) in addition to perchlorate contaminated food, 1 in 8 one-year-olds would be exposed above EPA's "safe" dose. Numbers may be even higher in communities within the 27 states where government tap water tests have found perchlorate at levels exceeding 6 ppb (see Figure 1). Food and tap water combined: At EPA's drinking water equivalent level of 24.5 ppb, 1 in 3 one-year-olds would be exposed above what EPA considers safe. Numbers may be even higher in communities within the 12 states where government tap water tests have found perchlorate at levels exceeding 24.5 ppb (see Figure 1). Young children are particularly vulnerable to perchlorate-related health effects because their brain and organ development is mediated by hormones produced by the thyroid, the gland targeted by perchlorate (Zoeller et al 2002, Ginsberg et al 2007). Recent research shows that infants can suffer permanent neurological deficits from short-term thyroid hormone insufficiency (Zoeller 2006). EWG's analyses focus on one-year-olds, who face new perchlorate exposures when they shift from formula and breast milk to solid foods, milk, and juice. Newborns are also at risk when they ingest perchlorate-contaminated breast milk or formula reconstituted with contaminated tap water (EWG 2007). In addition, pregnant women are particularly vulnerable to perchlorate. An October 2006 EWG analysis of data from the Centers for Disease Control and Prevention (CDC) found that for more than 2 million women with lower iodine levels, exposure to perchlorate from contaminated food and tap water at levels equal to or lower than proposed national and state standards could result in significant decreases in thyroid hormone levels (EWG 2006). If these women become pregnant, they would require medical treatment to prevent abnormal brain development in their babies. Insufficient iodine in the diet heightens perchlorate toxicity. Ongoing defense industry efforts to scuttle safety standards for perchlorate in drinking water continue to place public health at risk, particularly for pregnant women, for newborns, and for the estimated 1 in 16 one-year-old children overexposed to rocket fuel from contaminated food alone. EWG recommends that EPA promptly establish a tap water standard for perchlorate to help protect these vulnerable and widely-exposed Americans. In May 2007, the Food and Drug Administration (FDA) released a market basket study that examined perchlorate exposure via food and non-tap water beverage consumption among adults and children, ages 2 and up (FDA 2007). Notably, the FDA found that children ages 2 to 5 were particularly likely to be getting high perchlorate exposure via food consumption, and that some children are getting more than half as much perchlorate as the EPA considers safe each day just from the 27 kinds of foods and beverages that the agency included in its analysis. Yet the FDA study had several key shortcomings. First, it did not consider tap-water consumption in its exposure estimates, even though public water supplies in 28 states are contaminated with perchlorate. Second, the study did not look at perchlorate exposure in children under the age of 2, a population that is particularly vulnerable to perchlorate-related health effects. Third, the study looked only at 27 different types of food and beverages which, according to FDA, account for just 32 and 42 percent of the diet of adults and children, respectively. EWG conducted an independent analysis of the FDA’s food and beverage contamination data, including younger children excluded in the FDA analysis, and assessed the additive impact of exposures to perchlorate in contaminated drinking water. Our analysis shows that one-year-olds are the most highly exposed group, with perchlorate exposures for 6.1% of children in this age group exceeding the EPA “safe" dose considering food contamination alone. And we found that when one-year-olds are also exposed to perchlorate in contaminated tap water, at levels as low as 6 parts per billion (ppb), the percentage of overexposed children almost doubles to 12%. Two year-olds were close behind, with 2.1% of children in this age group exceeding the EPA “safe" dose from food alone, and 6.6% exceeding the EPA “safe" dose when also exposed to water contaminated with 6 ppb of perchlorate. These FDA and EWG analyses showing that children have especially high exposures to perchlorate from food and water confirm an earlier estimate from the CDC showing that children are exposed to more perchlorate than adults (Blount et al 2006a). The analyses we conducted were patterned after FDA's. We were able to closely replicate their findings. Our model was designed to predict average, chronic exposure levels for children ages 1 to 5 to perchlorate in food and drinking water, based on their normal dietary patterns. We relied on CDC’s National Health and Examination Survey (NHANES) data from 1999-2004 to determine consumption patterns for children, body weights, and daily water intake. We conducted a Monte Carlo simulation in which children were assigned perchlorate concentrations from the FDA database for foods contaminated with perchlorate. For each child included in the simulation and for each consumption event, we randomly assigned a perchlorate concentration from the FDA data where a perchlorate value could be matched to the food the child was eating. EWG analyzed the distribution of chronic exposures for children and calculated the percentage of children that would exceed the EPA “safe" dose of 0.7 ug/kg/day from food exposures alone. We then did similar calculations assuming children consumed tap water contaminated with perchlorate at concentrations of 2, 6, and 24.5 ppb. We did not attempt to correct for the fact that the FDA's database of perchlorate contamination in food and beverages contained only 27 types of food, while many other fruits and vegetables (including children's favorites such as bananas, plums, and raspberries) are known to be contaminated with perchlorate (El Aribi et al 2006). Our exposure estimates therefore likely underestimate the fraction of children exposed to perchlorate in excess of safe levels. Young children are exposed to more perchlorate than adults, pound for pound, for several reasons. First, FDA analysis of individual food and beverages shows that items like milk, fruit juices, tomatoes, and carrots contribute heavily to an individuals total food intake of perchlorate, and these items are very popular with children (FDA 2007). In addition, children also consume more water on a milliliter per kilogram of bodyweight basis than adults, so perchlorate is more concentrated in their bodies (Zoeller 2006). Infants and children are also known to be particularly susceptible to perchlorate-related health effects. Perchlorate acts by inhibiting the thyroid gland from taking up iodine from the circulation. Since iodine is the main building block for thyroid hormone, by inhibiting this process, exposure to perchlorate can result in decreased thyroid hormone production by the thyroid gland. Adequate circulating levels of thyroid hormones are critical to maintaining normal metabolism in adults, but are especially important for pregnant women, infants, and children (Zoeller et al 2002, Ginsberg et al 2007). The developing fetus is dependent to a great degree on thyroid hormone from the mother. Low maternal thyroid hormone levels have direct repercussions on her developing fetus and may result in abnormal brain development (Zoeller 2002, Ginsberg 2007). Likewise, infancy and early childhood are times of rapid growth and brain development, and any abnormal decreases in thyroid hormone levels during these critical periods may lead to severe inhibition of these processes (Ginsberg et al 2007). Children are also especially sensitive to perchlorate because of their unique physiology. Perchlorate acts as an inhibitor of iodine uptake by the thyroid. It is well established that children, because of rapid growth and development, require more iodine on a body weight basis than adults. In fact, young children require 3 times the daily iodine intake when compared with adults (WHO 1998). Therefore, a thyroid toxin like perchlorate that impacts the uptake of iodine by the thyroid gland could have a greater impact on children than adults. Increased iodine requirements in children combined with confirmed, higher exposure to perchlorate among children makes them uniquely vulnerable to this contaminant. Children may suffer from stunted growth and delays in intellectual development if they have inadequate levels of thyroid hormones. This analysis of FDA data shows that while the vast majority of Americans are exposed to perchlorate through commonly eaten foods, a significant number of children are exposed to levels that exceed the EPA "safe" dose from food and water exposures. Those children with combined exposures are at highest risk for exceeding the EPA "safe" dose, underscoring the need for a national drinking water standard for this thyroid toxin. In September of 2006, the Centers for Disease Control and Prevention (CDC) published the first major epidemiological study of the potential health impacts of chronic perchlorate exposure. Researchers found a statistically significant, dose-dependent association between perchlorate exposure and changes in thyroid hormone levels in all women in the study (Blount et al 2006b). The effects on thyroid hormones were particularly pronounced in women with lower iodine intake. Among these women, a urinary perchlorate level of only 5 parts per billion was associated with a 16 percent change in thyroid hormone levels, compared to the median level found in the study. The authors noted that 36 percent of U.S. women have iodine intakes in the range identified as "lower" in the study. For about 1 in 10 of these women, if they were exposed to 5 parts per billion of perchlorate in drinking water, the resulting hormone disruption would require treatment for sub-clinical hypothyroidism, according to a consensus of clinical endocrinologists. (Cooper 2004, EWG 2006). Notably, the CDC study was published after the EPA established its “safe” dose level for perchlorate (RfD). While the EPA’s RfD assumed that exposure to 24.5 ppb in drinking water would have no effect on thyroid hormone levels, the CDC found that much lower exposures were having measurable, real-world effects of women’s thyroid hormone levels. CDC’s findings demonstrate that EPA's current reference dose is not health protective. CDC's study findings also indicate that a greater proportion of young children than noted in EWG's analysis exceed an actual safe dose of perchlorate from the consumption of contaminated food and drinking water. Many studies confirm that Americans face widespread perchlorate exposure. A 2005 Government Accountability Office (GAO) report found perchlorate contamination of drinking water supplies in 28 states, at concentrations ranging from 4 ppb to over 420 ppb (GAO 2005). And a 2006 CDC study found perchlorate in the urine of every one of a nationally representative group of 2,820 people they tested (Blount et al 2006a). More importantly, these exposures are reaching levels that could measurably impact health. EWG's analysis shows that many one-year-olds exceed the EPA's "safe" dose of perchlorate via food contamination alone, and this number is higher in communities with perchlorate-contaminated tap water. The CDC's 2006 study found significant perchlorate-related decreases in thyroid hormone levels in women with perchlorate exposure far below the EPA "safe" dose. Yet the EPA and the FDA have yet to take action to protect the US population from this public health threat. Several states, including California, New Jersey, and Massachusetts have already or are in the process of setting their own drinking water standards in the face of federal inaction. However, EWG's analysis of FDA food tests shows that even these state standards, while a step in the right direction, do not adequately protect human health given the widespread contamination of food by perchlorate. EWG's analysis of FDA's food tests adds to the growing body of science confirming that perchlorate exposures present a major public health threat, especially to vulnerable populations like pregnant women, infants, and children. The EPA should promptly establish a safety standard for perchlorate in tap water that accounts for findings from the CDC that show that exposures to perchlorate at levels far lower than the EPA's current "safe" dose (the RfD) have significant effects on the thyroid gland. A health-protective drinking water standard must account for widespread, significant exposures to perchlorate from food. It is important for everyone, especially children, to eat a well balanced diet that includes the recommended number of servings of milk, fruits, and vegetables. However, perchlorate contamination of food is especially of concern in children and additional exposure from contaminated water may result in cumulative exposures that exceed the EPA “safe” dose for many children. Therefore, FDA should provide consumers with guidance on choosing foods that reduce the risk of excess perchlorate exposures, particularly during pregnancy and early childhood. Caldwell KL, Jones R, Hollowell JG. 2005. Urinary iodine concentration: United States National Health and Nutrition Examination Survey 2001-2002. Thyroid 15: 692-99.
Cooper D. 2004. Sub-clinical thyroid disease: consensus or conundrum. Clinical Endocrinology 60: 410-412. El Aribi H, Le Blanc YJ, Antonsen S, Sakuma T. 2006. Analysis of perchlorate in foods and beverages by ion chromatography coupled with tandem mass spectrometry (IC-ESI-MS/MS). Analytica Chimica Acta 567(1): 39-47. Environmental Working Group. 2006. Thyroid Threat: Under proposed rocket fuel standards, many women would need treatment to protect baby. Available at www.ewg.org/reports/thyroidthreat. Environmental Working Group. 2007. New study from CDC and Boston University shows babies getting unsafe dose of perchlorate. Available at www.ewg.org/node/20968. GAO (U.S. Government Accountability Office). 2005. Perchlorate: A system to tract sampling and cleanup results is needed. GAO-05-462. 20 May 2005. Ginsberg GL, Hattis DB, Zoeller RT, Rice DC. 2007. Evaluation of the U.S. EPA/OSWER preliminary remediation goal for perchlorate in groundwater; focus on exposure to nursing infants. Environmental Health Perspectives 115(3): 361-69. Haddow JE, Palomaki GE, Allan WC, Williams JR, Knight GJ, Gagnon J, O’Heir CE, Mitchell ML, Hermos RJ, Waisbren SE, Fair JD, Klein JZ. 1999. Maternal thyroid deficiency during pregnancy and subsequent neuropsychological development of the child. New England Journal of Medicine 341:549-55. National Academies Press. 2005. Health implications of perchlorate ingestion. Pg 67. Pop VJ, Kuijpens KL, van Baar AL, Verkerk G, van Son MM, de Vijider JJ, Vulsma T, Wiersinga WM, Drexhage HA, Vader HL. 1999. Low maternal free thyroxine concentrations during early pregnancy are associated with impaired psychomotor development in early infancy. Clinical Endocrinology 50: 149-55.
WHO (World Health Organization and Food and Agriculture Organization). 1998. Vitamin and mineral requirements in human nutrition. Second edition. September 1998. Available at: http://whqlibdoc.who.int/publications/2004/9241546123.pdf. Zoeller RT, Dowling ALS, Herzig CTA, Iannacone EA, Gauger KJ, Bansal R. 2002. Thyroid hormone, brain development, and the environment. Environmental Health Perspectives 110(3): 355-361. Zoeller T. 2006. Collision of basic and applied approaches to risk assessment of thyroid toxicants. Annals of the New York Academy of Sciences 1076: 168-90.